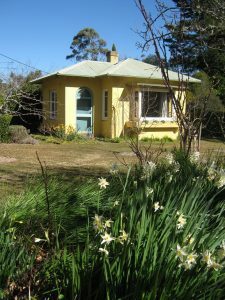 Last year I was fortunate enough to be awarded a PIP residential fellowship at Varuna House, to give me time to do the final edit on the young adult novel I’ve been working on. I’ve been meaning to post about it for ages, but work, study, family and life in general have all been clogging up my time, as usual, which was why I was so grateful to get the fellowship in the first place. 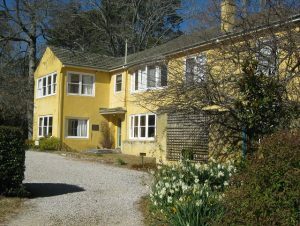 Varuna house is dedicated to writers, and it’s completely geared towards giving the five writers in residence an opportunity to concentrate completely on writing. No family commitments. No distractions. No schedule apart from showing up for the lovely dinner that has been cooked for you each evening. And four other writers to chat to in the evenings over a glass of wine. What more could you want? Eleanor Dark’s studio, which looks out over the gardens. 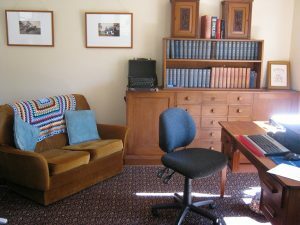 I was lucky enough to be allotted Eleanor Dark’s garden studio to write in, although it was a bit daunting to sit down each morning at her actual desk. Writing young adult science fiction seemed a very long way from ‘The Timeless Land’. But, inferiority complexes aside, I had an amazing and very productive week, and I’d like to take the opportunity to thank the Eleanor Dark Foundation and the lovely staff at Varuna House for making it all possible. Inside Eleanor’s studio, including her original desk.